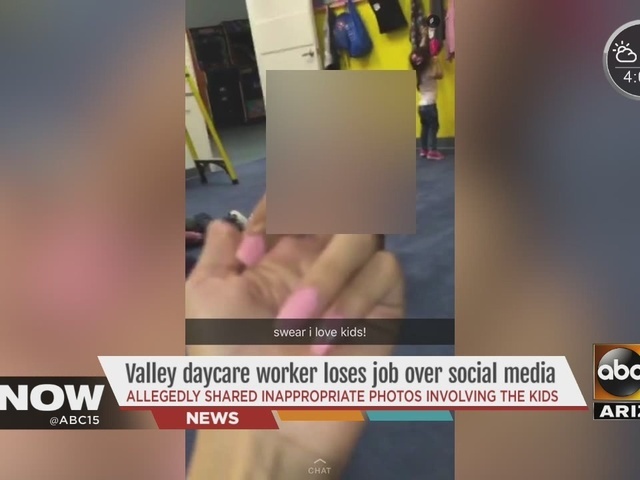 A Mesa, Arizona daycare worker is off the job after pictures surfaced on social media that appeared to show her holding up her middle finger to a child. "That's pretty much what got her terminated. She was in the class and she did have a birdie up," said Dorothy Thornton, owner of Kids Play Daycare. "She's only 19. I think she just made a dumb mistake." Thornton said the worker even showed the video to some of the parents. "The parents didn't have a problem with her and they didn't have a problem with the videos," said Thornton. One of the videos show kids fighting over a toy. Two children appear to hit a third. Thornton, who said she's been in business for more than 20 years, doesn't see anything wrong with the video of the kids. She said it's just the one of the finger that concerns her. "It's some kids around one kid and it looks like one of the kids trying to pull the kid, then it's a birdie. That's what I saw," she said. Thornton said she contacted the Arizona Health Department and Mesa Police Department. Mesa Police detective Steve Flores said they have interviewed the worker. Flores said at this point, they have not seen anything that is criminal in the videos.